Clutching a notepad, I wade through the ocean of people that is Stratford Broadway on a sunny Saturday afternoon, trying not to get pulled into a market stall or, even worse, the throng heading for Westfield. Unlike the majority of people here, I’m not shoe shopping or bargain hunting; I’m here to see Jasmine Stone of Focus E15 Mothers. I heard the cries of “fight for social justice” and “social housing is a human right” as soon as I stepped out of the air conditioned confines of the Stratford Centre, making a beeline towards the bright yellow canvas banner flapping in the wind. 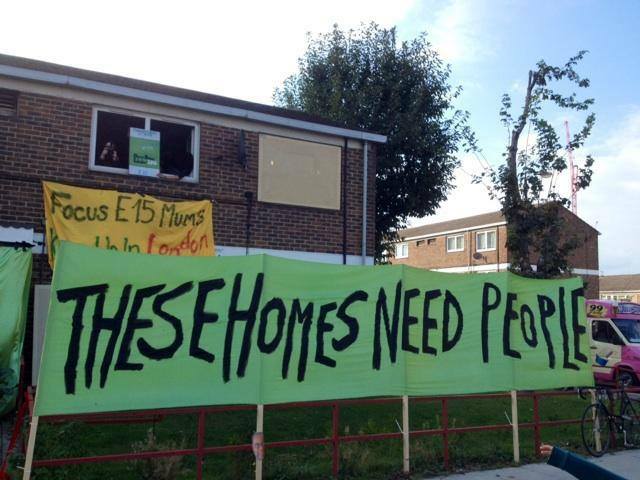 Printed on it, in green paint, are the words: ‘Focus E15 Mothers – Keep Us In London. Focus E15 Mothers formed in September 2013, when 29 single mothers were facing eviction from their temporary hostel, due to a £41,000 funding cut by Newham council. The option giving to them: relocating hundreds of miles away from their families, friends and children’s schools, to towns and cities such as Manchester, Birmingham or Hastings. Sure, austerity has been rife and savings have to be made. However, this particularly brutal budget slash was carried out at around the same time Newham council loaned £40m to West Ham football club so they could move to the Olympic stadium, with around £9bn having been invested in the borough for the 2012 Olympics. It seems those clutching the purse strings were eager to please sporting giants, but not provide basic needs to its own residents. Jasmine Stone – one of the original 29 affected by the funding cut – believes this is part of a wider problem. “Social cleansing in London is a huge issue and it’s only getting worse. Before our campaign started, all 29 of the Focus E15 mothers were facing eviction, and we were told we would be rehoused in areas outside of London. Thankfully, since we began protesting, we have been rehoused in the Newham borough, which means we’re close to our families and support networks. Jasmine is also critical of Newham council’s decision to spend £111m on a new head office (Building 1000), comprising £92m in 2010 and a further £18.7m investment on refurbishing. To add salt to the wound, it has been reported that the council is considering moving back to its old office buildings, as it has been unable to sell them on. The original members of Focus E15 Mothers may have been rehoused in their preferred location, for now, but their fight for social housing continues – and now, they’re fighting for all of us. 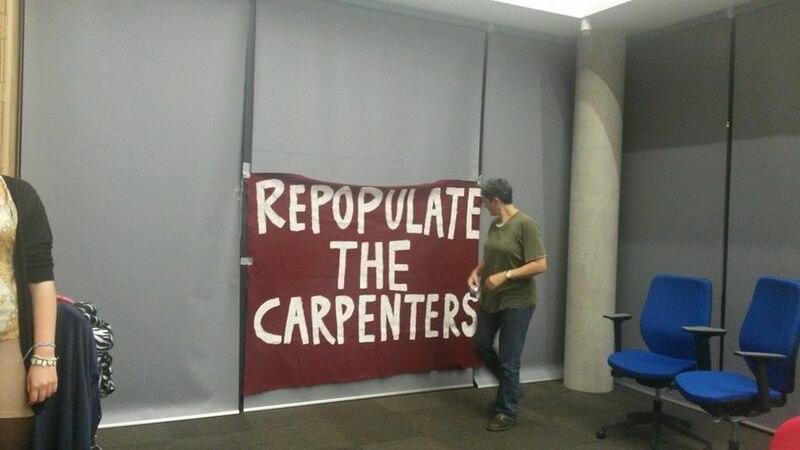 The young mums recently staged a demonstration at the Carpenters Estate, adorning the front of dilapidated properties with banners, posters and their anger at the lack of affordable housing in Newham. So, what is the goal of Focus E15 mothers now? This entry was posted in Social Issues and tagged Carpenters Estate, Focus E15 Mothers, homelessness, Newham, Newham council, social cleansing, social housing, young mums. Bookmark the permalink.